This article has been modified from its orginial version. Oregon City's Roxane Riseling said it was "very weird" to get a letter from the elections office for her daughter Megan saying that signatures didn't match after the September police-bond measure; the same thing happened to both the mother and daughter in two different recent elections, and they say that their signatures "haven't changed." 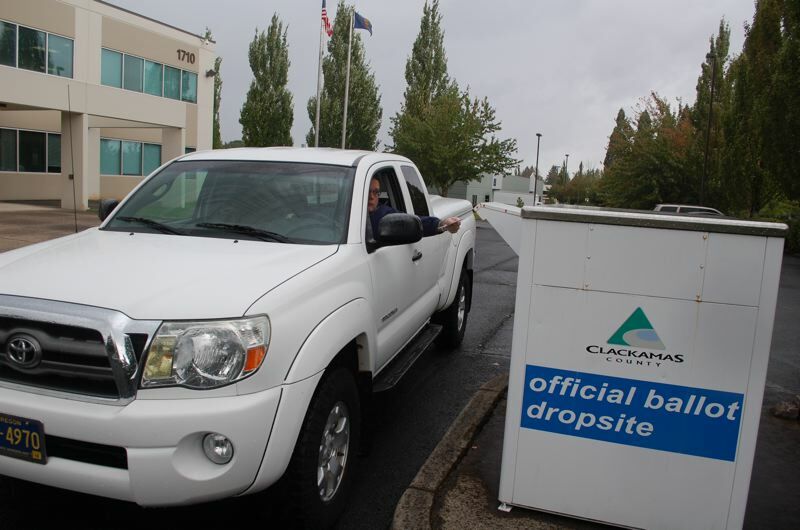 Clackamas County has some of the highest proportions of ballots being rejected because county elections officials determine that the voter's signature on the ballot doesn't match their registration card. According to state law, these voters are sent a notice telling them to send in a new registration card or their vote won't be counted. But most voters don't respond to the notice and end up getting kicked off the registration rolls. Over time, this can have the effect of disenfranchising large numbers of voters. Although voters are given a prepaid envelope to send in a new voter-registration form when their local election's office determines that they mailed in a bad signature, they are given no guarantee that the new signature will cause their vote to be counted. Local elections offices can decide that the new signature doesn't match what the voter signed on the latest ballot and keep the ballot in the "challenge" pile. Names and addresses of voters in the challenge pile become public record on the eighth day after an election, at which point voters still have another seven days to get to their elections office and prove they are who they say they are. Portland-area elections officials keep no records of signatures that were rejected a second time in a single election, but all three metro-area county elections offices believe that it's an unusual occurrence. "The scenario you mention, where a voter returns a registration card and the signature still does not match, is very rare," said Mickie Kawai, the top elections official for Washington County. "I know we have had some over the years because we still have a double-triple check process when we reject a ballot." Compared to Washington County, Clackamas and Multnomah counties are more likely to engage in the practice of disqualifying voters due to perceived differences in signatures. Washington County engaged in the practice in 20 to 50 percent fewer cases on average during the past two elections. Clackamas County Elections Clerk Sherry Hall declined to offer a theory on why these numbers differ from county to county and election to election. "We had generally the same staff working each election, and I'm confident in the staff's ability to perform this work," Hall said. "Why a slightly different percentage of voters who cast a ballot used a signature which doesn't match their registration record in November '16 compared to May '17 is a question I don't think we can ever answer." Hall thought it would be suspicious if all three of the metro-area counties rejected signatures at the same rate. "A minor range is to be expected and that's the case," Hall said. "We have the highest percentage in November but not in May." While elections officials in Clackamas County point out that they're sending out these notices to less than 1 percent of voters each election, even in single elections there are large numbers of voters at stake. A total of 1,455 ballots were challenged by Clackamas County for "mismatched signatures" in the November 2016 election. It's unclear how much taxpayer money goes into inspecting ballot signatures. Elections workers statewide receive training from Oregon State Police forensic experts and inspect signatures as part of their various duties. There were about 87 registered Republicans for every 100 registered Democrats in Clackamas County who cast ballots in the November 2016 election. However, the county elections office has shed voter registrations due to rejected signatures for 343 Democrats and 293 Republicans in the November 2016 election, about 85 Republicans for every 100 Democrats. In May 2017, the elections office kicked 113 Democratic Party members off the voter rolls, while only removing 80 Republican Party members, or only about 71 Republicans for every 100 Democrats. Sherry Healy of Clackamas, chair of the Democratic Party of Oregon's Elections Integrity Caucus, said she was concerned that Hall's registration as a Republican could affect the way that the elections office is run. "If you have someone with some partisan inclinations, you don't know how they're going to run elections," Healy said. "Rejecting signatures will suppress a percentage, and if you do various techniques for voter suppression it will obviously add up to a lot over the course of several elections." Hall pointed to a 2014 internal analysis of rejected signatures conducted by the Clackamas elections division showing a nearly 50-50 split between Democrats and Republicans in signatures that were deemed to be nonmatching. When Pamplin Media Group requested a copy of the report, however, county elections officials said "it appears the report was deleted at some point," because it uses old reports as a template for the next election. "I have a recollection of doing a hand count of the mismatched signatures from the printed OCVR report and comparing the count (for R's and D's) against the ballots returned by party, my distinct recollection is that they were almost exactly the same (within about a 10th of a percent)," wrote Clackamas County Elections Manager Steve Kindred. "I was satisfied that 'all was well' and that if anyone analyzed the publicly released information they would come up with the same conclusion." "There's this idea of a Trojan Horse, that you get something in there once, and then it's normalized," Healy said. "The next time you do it and it turns out to be partisan, and you say that it's always the way it's been done." 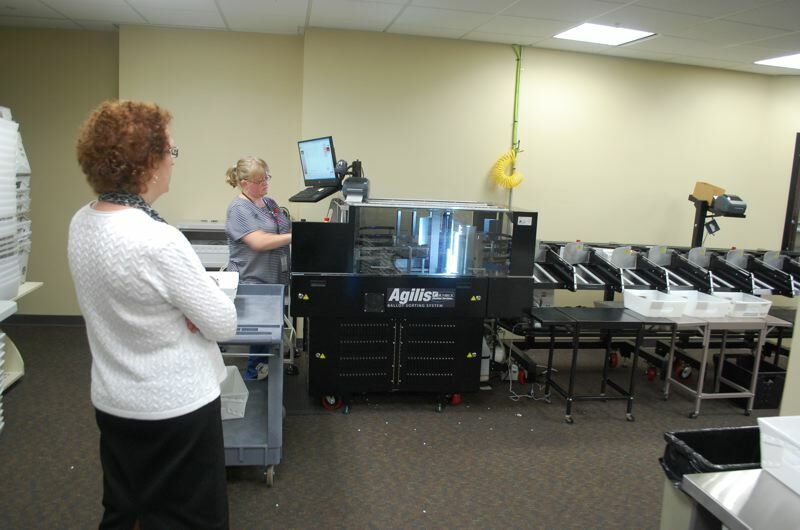 During the same week that a member of the county election staff looked for the missing records, the office was also dealing with the fact that the system was down for tracking whether your ballot has been received and accepted. Hall said that the elections office was contacting the contracted service provider of the tracking system and would not put out a notice to voters notifying them that the system was broken. BallotTrax remained on the county's website as a tool for tracking ballots even though the system didn't recognize that a September election was occurring. "One of my staff has been working with the BallotTrax folks to determine what the problem is," Hall said. Hall said she hasn't decided whether she'll run for re-election as clerk, but the current issues promise to become part of political campaigns. Pamela White, a Democrat in Oregon City, has filed for the clerk's seat and said that she was "blown away" by Clackamas County's signature-rejection numbers from the September election. 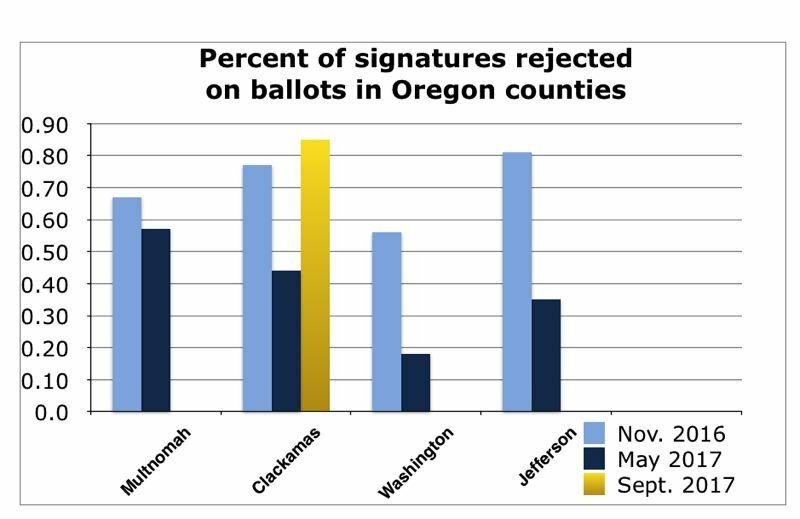 Hall said that the larger proportion of rejected signatures in September has no comparison with other Oregon counties and declined to provide a theory as to why more signatures from Oregon City didn't match in the past election. Oregon City's Ashli Soderlind, whose signature was rejected during the September election, recently married and changed her last name to Bosnjak but was surprised that the elections office knew she signed any differently because her signature is "just scribbles." She wondered if the elections office put her signature under extra scrutiny because women are more likely to change their names. Hall responded that gender and ethnicity are not even considered during the signature review process. Neither gender nor ethnicity is part of a voter's registration information. Election workers are trained to look at the shapes of people's signatures, and not try to make inferences about people based on their names. White said at the very least the elections office should let voters know that their signatures could be rejected under current Oregon law. She encouraged the elections office to communicate more with voters about common ballot errors and about election resources like BallotTrax. In response to the idea of putting out more factual information to voters, Hall said that many people don't follow the directions on ballots currently. "That's a cop-out in my opinion," White said. "That's might be true, but that doesn't mean that you stop doing it." Oregon City's Travis Schweiter couldn't believe he received a letter from the elections office when he hadn't ever changed how he signs his name. "My first thought when I got it was that I can appreciate that they're looking out for voter fraud, but my next thought was that I've been a registered voter for 20 years; maybe my signature has changed over that time," Schweiter said. How about preventing voter fraud, you ask? State officials didn't find a single case of voter fraud using signature verification, out of the 54 cases they're investigating from the November 2016 election. Using multi-state data-matching techniques, the Elections Division identified 46 voters in the election who appeared to have cast ballots in both Oregon and another state. Six ballots appeared to have been submitted under the names of deceased Oregon voters, and two registered Oregon voters each apparently cast two ballots in Oregon. "The November 2016 election was the first time we had all the tools that could help us analyze voter history," said Debra Royal, chief of staff for Oregon Secretary of State Dennis Richardson. "It will only work in November of even numbered years since that is the only time all states share the same election day. States have different election dates than Oregon for their primary and local elections." The Oregon Secretary of State's Office has rejected Pamplin Media Group's public-records request for the counties of origin of the 54 cases under investigation. The Oregon Department of Justice also refused to provide any additional information about the 54 cases, as they are part of a "pending review." This week, the DOJ plans to release a list of adjudicated voter-fraud cases from previous elections, in response to another part of the Pamplin Media request that was rejected by the secretery of state. Hall said that the closest thing to voter fraud ever identified by Clackamas County through signature verification was a case of a husband and wife getting their ballot envelopes mixed up and signing each other's envelopes. Both of their ballots were challenged for mismatched signatures, Hall said, even though they were both eligible to vote on the same items in the election. If spouses sign each other's ballot envelopes, elections offices are able to accept and tally both ballots, as authorized by the state's administrative rules. Hall said that some voters don't take election integrity seriously enough, including Gladstone City Councilor Linda Neace who was recently found voting from her old Oregon City address years after she had moved to Gladstone. Hall said that she has an attorney who is asking questions of Neace; this attorney will help decide whether the case will be referred to the Secretary of State's Office for potential prosecution by the Department of Justice. 1. "Approximately equal numbers of Democrats and Republicans" has been corrected to about 87 registered Republicans who cast a ballot in the November 2016 election for every 100 registered Democrats in Clackamas County. Even when taking these registration proportions into account, the county has kicked a disproportionate number of Democrats off the voter rolls due to mismatched signatures in recent elections. 2. Hall said that the spouses who switched their ballot envelopes had their ballot signatures "challenged," which is not necessarily rejected. The spouses then could have their challenged ballots counted, according to the provisions in state administrative rules. 3. Hall's attorney will help decide whether the Linda Neace case will be referred to the Secretary of State's Office for potential prosecution by the Department of Justice. Hall did not say that her attorney will help decide the jurisdiction of the case. She said that she did not know who would have jurisdiction over the case and said that "I'm relying on him [her attorney] to know all these things."